There are no simple solutions, no detailed maps of ground-water presence, and no guarantees. But information is available that can be helpful when making a decision about whether to drill, or where to drill. This publication discusses points to consider when evaluating water-well potential and outlines basic steps to get the information you need. To further your understanding of the available information and why some areas provide water and others do not, we begin with a brief discussion of basic principles that govern ground-water occurrences. Figure 1--The hydrologic cycle. Precipitation falls to the earth's surface, runs off or infiltrates the ground, then moves back to the surface and into the atmosphere through transpiration or evaporation. The alluvial aquifer is the cross sectional area shown in yellow and labeled alluvium. Figure 2--Confined and unconfined aquifers and how they affect water levels in wells screened in each type of aquifer. Fractured aquifers are rocks in which ground water moves through cracks, joints, or fractures in otherwise solid rock. 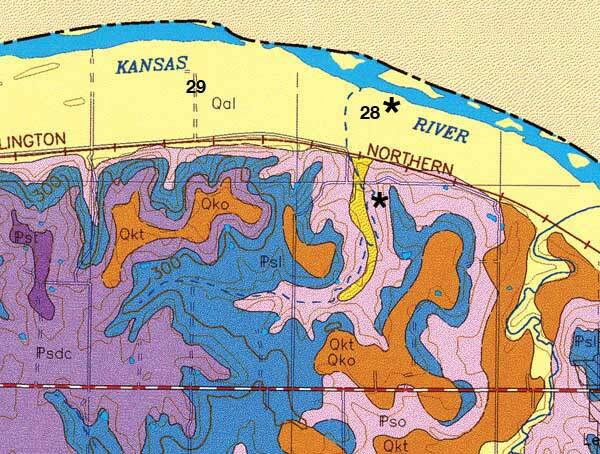 Some limestones in Kansas are fractured aquifers. Drilling a well into an unconfined aquifer is often easier and less expensive than drilling into a confined aquifer. Unconfined aquifers are generally nearer the surface, so wells are shallower. Also, many unconfined aquifers are unconsolidated (for example, alluvial aquifers), thus more easily drilled, whereas confined aquifers more often are reached by drilling through hard rock. On the other hand, near-surface, unconfined aquifers are more susceptible to contamination than confined aquifers that are sealed off from surface contaminants. The chemical nature of water continually changes as it moves through the hydrologic cycle. 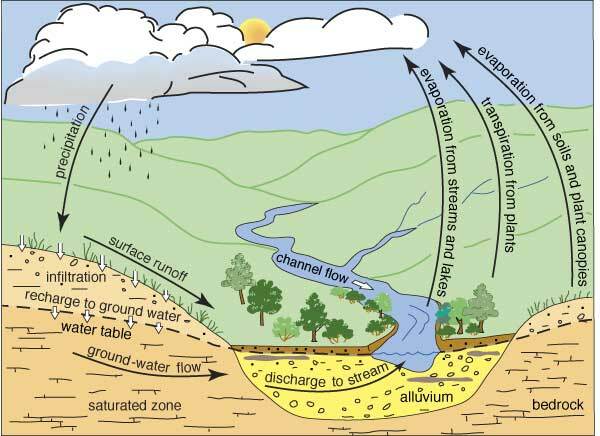 Although ground-water chemistry depends, in part, on the initial chemistry of the precipitation and recharge water, the most important natural changes in ground-water chemistry occur in the soil. Ground water may dissolve substances it encounters or it may deposit some of its constituents along the way. The eventual quality of the ground water depends on the kinds of rock and soil formations through which it flows. Thus, ground water in some areas may be too salty or contain too much bicarbonate of soda for domestic use or irrigation. Iron content can be very high in some settings, which usually does not render the water unusable, but it can be a nuisance because of rust staining of plumbing fixtures and an undesirable taste and smell. It is advisable to have the water in a new well tested to determine its quality and suitability for use (see "Additional Information and Contacts"). Here is a list of steps you can follow in evaluating the potential for a water well on a particular piece of property. Some steps are more critical than others, but each one can provide valuable information. One of the first things you need to know is the specific location of the property. It must be stated in terms of the Public Land Survey System, that is, by the legal land description, or, in other words, by section, township, and range, and by quarters within the section (see KGS Public Information Circular #20). This step is necessary because all well records and land records are recorded in this way. For example, all water-well records at the Kansas Geological Survey (KGS) in Lawrence are sorted, recorded, and filed by section, township, and range; likewise, they are searchable on the KGS website in the same manner (discussed below). Additionally, this information is important when locating the property on a county, topographic, or geologic map. Your next step should be to determine what wells have been drilled in your area, to what depths, and with what results. This will usually indicate what you can expect to encounter on your property, although results can vary widely in some areas. Public access to records for water wells that have been drilled in Kansas is provided by the Data Resources Library at the KGS, and the records can be accessed online, by phone, or in person (see contact information below). The quickest and easiest approach to finding information about water wells that have been drilled in the state is to access the records electronically on the KGS website (www.kgs.ku.edu) (fig. 3). Once there, click on the "WWC5" link under the "Water" heading (WWC5 refers to the name of the form submitted to the state by water-well drillers to record a well). This gives you a page that allows you to search by legal description or by county. To search by legal description, enter the section, township, and range in the appropriate boxes, then click "Select by T-R." You will get a chart of all wells listed in that section. To see a record for an individual well, click on the location information for that well. The record for each well includes location, owner, depth, water level, well use, and completion date. Some wells have lithologic logs available, which describe the types of rock encountered at different levels of drilling. Scanned images of some WWC5 forms are available on the website, showing exactly what the driller recorded for that well; these images also can be printed or downloaded. 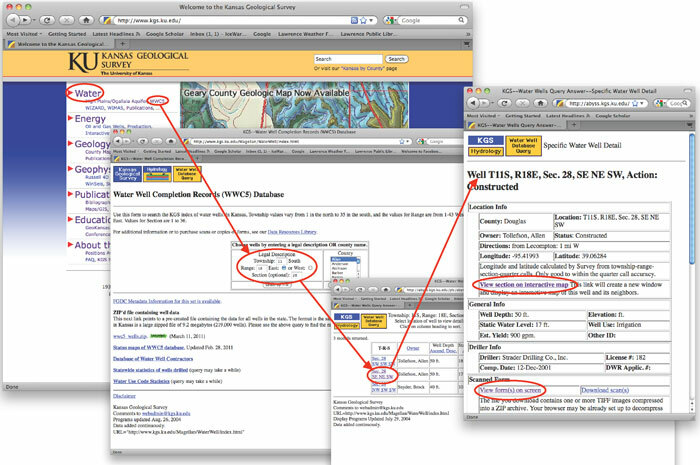 Figure 3--Successive KGS web pages accessed by clicking on the circled links, leading to information pertinent to drilling a water well. Such records are valuable because they provide information about existing wells that are close to the drilling location you are considering (or at least the closest wells for which the state has records). Water-well records for which scans are not available online can be viewed in person or copies can be requested from the KGS by phone or e-mail. WWC5 forms have been required by the state since 1974. The KGS has some well records dated prior to that, but they were not required at that time. Consequently, the collection of records after 1974 is essentially complete, whereas the collection prior to that date is less complete. Figure 4 is an example of a WWC5 form. These forms contain useful information about each well, but for our purposes, the most important information is the location, depth of completed well, static water level, and yield. Of course, location allows us to plot the well on a map and see where it is situated relative to the property of interest. Well depth and water level tell us how deep a well must be drilled to access water. Yield tells us how much water we can expect from a well. A yield of at least 4 to 5 gallons per minute (gpm) is considered the minimum amount necessary to provide adequate water for domestic household use. Much larger yields are necessary for large-scale irrigation. 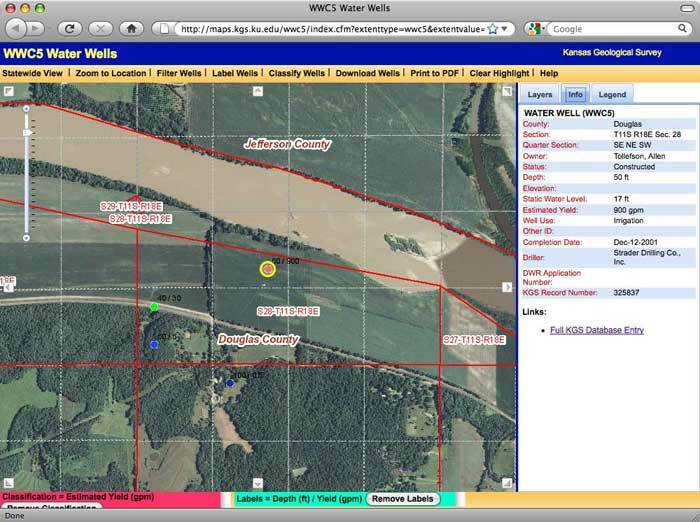 Figure 4--Example of a WWC5 form for a well drilled in Douglas County, near the Kansas River. Plotting well locations, depths, and yields on a map to get a clear picture of trends is often useful. Fortunately, a mapping feature is available on the KGS website, associated with the WWC5 database. To access this feature, go to an individual well record on the KGS website, as previously described. Click on the link that says "View section on interactive map" (see fig. 3). This opens a new browser window in which a map is shown of the section where the well is located (fig. 5). Well locations are indicated by colored dots, and the user can choose whether the colors of the dots represent yields, well depths, or static water levels. Different labeling choices for the wells also are available, and you can zoom in or zoom out on the map. If the user clicks on a particular dot, information for that well will be displayed on the right, and the full database entry for the well can be obtained by clicking on the blue link below the displayed well information. An array of overlays can be added to the map, such as the Public Land Survey System grid, a topographic map, and a base map showing roads, towns, and other features by clicking on the corresponding boxes under the "Layers" tab on the right. One of the more useful and enjoyable overlays is composed of aerial photographs; editions from different years are available. Figure 5--Water-well mapping page from the KGS website. This map, with an aerial photo overlay, is zoomed in to the area of the well represented by the WWC5 form in fig. 4 (well shown in upper center of map; label shows well depth over yield; note well information to the right of map). It is also part of the same area shown on the map in fig. 6. Figure 6--Portion of a geologic map of Douglas County, on which we have plotted the locations of two wells drilled very close together (shown by asterisks), but with very different yields (also see fig. 5). The WWC5 form shown in fig. 4 is for the well located in section 28. The WIZARD database also may be useful. The primary function of this database is to record water levels for wells in the High Plains aquifer in western Kansas that are measured each year by the KGS and other cooperating agencies. It can be accessed through the KGS website homepage, or it can be accessed directly at www.kgs.ku.edu/Magellan/WaterLevels/index.html. This page gives several search options, and a mapping application is available online. On the water-well listing page that appears after initiating a search, clickable buttons are displayed that lead to information on regional trends, statistics, and other information for the listed wells. On the individual well page, in addition to the well information, you might also see a photo of the well head, and you can access the annual water-level measurements for the well and a graph that plots changes in ground-water levels over time. Geologic maps, topographic maps, and aquifer maps can provide information of varying utility. Maps of aquifers, such as the High Plains aquifer or the Dakota aquifer, are available online on the KGS website or in paper format. These are statewide maps and thus give only generalized information about the aquifer locations. Geologic maps and topographic maps are more useful for local interpretations. Geologic maps show the distribution of rock formations exposed at the surface, and thus indicate the nature and types of consolidated or unconsolidated materials in an area. The type of geologic materials and the topography of the earth's surface in an area influence the location of ground water. Assessing these characteristics can help you determine the potential of a specific area to yield water to wells. For example, ground water generally exists nearer the surface and in larger quantities in valleys rather than in upland areas. In effect, the water table is not always a level surface, but rather a subdued version of the ground surface (fig. 1). A geologic map also can be useful in an area where ground water is virtually nonexistent in bedrock formations, but is plentiful in an adjacent alluvial aquifer along a major river. This is typical of some eastern Kansas locations, such as the example shown in fig. 6 in northwestern Douglas County. In section 28, a well drilled in the alluvial aquifer (shown in yellow on the map) that lies along the Kansas River has a reported yield of 900 gallons per minute (gpm). A well drilled into limestone and shale bedrock, less than a half-mile away, in section 33, has a reported yield of 0.5 gpm. The latter well does not yield enough water even for domestic use, whereas the former yields enough water for large-scale irrigation. In this case, such information pinpoints where successful wells may or may not be drilled. In other, less clear-cut cases, a geologic map can be used to infer the rock units that underlie a property. These maps can be used in conjunction with ground-water reports, such as KGS county bulletins (see discussion below) that are available for many counties. These reports, although general in their content, often discuss the geologic units most likely to hold recoverable ground water, or they may indicate that water in certain units is of bad quality. Topographic maps, which show contours of surface elevations, provide information on the size, shape, and distribution of features on the land surface, as well as the location of lakes, swamps, springs, streams, and important cultural information such as buildings, railroads, and highways. They are useful for locating properties and for plotting wells by hand, if so desired. Topographic maps constructed on a 7.5-minute (1:24,000 scale) base are the most useful for siting well locations. They can be used in a manner similar to geologic maps to assess water-well possibilities, as in the example cited above, except that rather than having the alluvial aquifer shown in a different color than the surrounding area, one can only estimate its boundaries based on elevation contours. Vegetation also is shown and may indicate where near-surface ground water exists, especially in more arid climates such as in western Kansas. Talk to your neighbors. Many wells exist for which no paper records have been submitted, especially older wells, and the only information available may be from the owners. Even if a record does exist, the owner may be able to provide a history of the well's production. If, after following the above steps, you need more information to make a decision, the KGS may have other resources available. As previously mentioned, ground-water reports are available for some counties in the form of KGS bulletins. The full text of some of these is available online on the KGS website, or paper copies can be ordered. Each is a general overview of the ground-water situation in a county, but they usually contain specific sample well information, and geologic maps and cross sections. They also discuss water quality. To see a list of information resources available for your county, click on the "Kansas by County" link on the KGS website. It shows everything the KGS has available for your county. Links will take you to that county's WWC5 database, simple geologic maps, and county bulletins, if available. If all else fails, KGS personnel with expertise in ground water are available to respond to public inquiries. Although they cannot conduct in-depth analyses for individuals, they can answer questions in a general way or help with finding information and data on the KGS website. They can be contacted by phone, e-mail, or in person. For more detailed analyses, it might be wise to consult a professional hydrogeology consultant. One of the most important steps in drilling a private water well is to select a reputable and responsible driller. Water-well contractors are available in most communities throughout the state. From their years of experience in the field, they possess a wealth of information about water-well possibilities in the areas where they have worked. Check local telephone directories for contact information. For more information about water-well contractors in Kansas, contact the Kansas Ground Water Association at P.O. Box 107, Mullinville, KS 67109, phone: (620) 548-2669 or their website www.kgwa.org. Finally, be sure to check with local and State regulatory agencies for permitting and construction regulations. See contact information below. Cost--Drilling a water well may involve a high initial cost, but the subsequent ongoing expenses, the cost of electricity for pumping the water and maintenance of the system, can be lower. Connecting to a water district also may involve a high initial cost, but it is often less than drilling a well. Subsequent monthly costs for water service can mount quickly if large amounts of water are used. Another important consideration is that a water meter generally improves the resale value of your property. Risk--Drilling a well in many places can be risky. There are no guarantees that you will hit adequate water of good quality, even in areas where other wells have been successful. Connecting to a water district essentially removes the risk involved in obtaining a dependable, high-quality water supply. Maintenance--When you have your own well, maintenance and its attendant costs are your responsibility. This can be troublesome, inconvenient, and expensive if pump, electrical, or piping problems arise. Being connected to a water district transfers most of the responsibility for maintenance to the district. Additionally, you most likely will still have water service even during electrical power outages at your house. Availability--In some water districts, water meters are limited, and long waiting lists force applicants to wait years for a hookup. In such cases, a water well may be an attractive alternative if adequate ground water is available within reasonable drilling depths. In other places, no adequate ground water exists and connecting to a public water utility may be the only alternative, unless you are willing to have water hauled to your property and placed in a storage tank. The Kansas State University Research and Extension website (click on "Publications," then "Environment and Natural Resources") offers a number of publications on drinking water and water wells. These publications also can be obtained from the local county extension office. Much of the responsibility for regulating water use in Kansas resides in two State agencies: the Kansas Department of Health and Environment (KDHE) and the Division of Water Resources (DWR) in the Kansas Department of Agriculture. The DWR is responsible for issuing rights to use water (or water rights) in the state. If you plan to use water for irrigation or for industrial/commercial uses, you need to file a water-right application with the DWR. People who drill water wells for their personal use (and not for larger-scale uses such as irrigation) do not need to apply for a water right, and thus generally do not need to interact with the DWR. The Kansas Department of Health and Environment has general responsibility for water-quality issues in the state. KDHE's Water Well program is designed to protect the state's ground water; it does that primarily through licensing and overseeing the state's water-well contractors. Through its Water Well unit, KDHE regulates the construction, treatment, and plugging of water wells. The program also accumulates data on water supplies in the state, mainly by requiring the filing of logs and records for each well drilled in the state. Water-well contractors should be familiar with these reporting requirements and should file the necessary forms at the completion of drilling. KDHE also is responsible for enforcing drinking-water quality standards in the state. It does that in concert with the U.S. Environmental Protection Agency. Enforcing those standards applies only to public water supplies, such as those operated by municipalities and rural water districts. Click here for more information about drinking-water standards. KDHE does not require private well owners to test the quality of water from their wells, although it does recommend that wells be tested for bacteria and nitrates. Water samples can be taken to any Kansas-certified laboratory. Contact information for water-testing labs in Kansas can be found online or contact your local health department. KDHE does require that water-well contractors chlorinate wells upon completion of drilling, and some Kansas counties require that wells be tested upon completion. Again, your water-well contractor should be familiar with these requirements. In addition to KDHE and DWR, Kansas has several state and local governmental entities with varying degrees of responsibility for water issues. The Kansas Water Office is responsible for water planning in the state. The State Conservation Commission deals with watershed flood-control project construction issues. Five Groundwater Management Districts in central and western Kansas deal with ground-water and irrigation issues in their districts. A number of watershed-management districts, rural water districts, and other local units of government address various water issues. In addition, a number of agencies undertake water-related research and provide information in Kansas, including the Kansas Geological Survey, the Kansas Biological Survey, Kansas State University's Cooperative Extension Service, the Kansas Water Resources Research Institute, the U.S. Geological Survey, the U.S. Army Corps of Engineers, the U.S. Bureau of Reclamation, and the Natural Resources Conservation Service. KGS Educational Series 10, Kansas Ground Water, 1993. KGS Bulletin 239, Perspectives on Sustainable Development of Water Resources in Kansas, 1998. 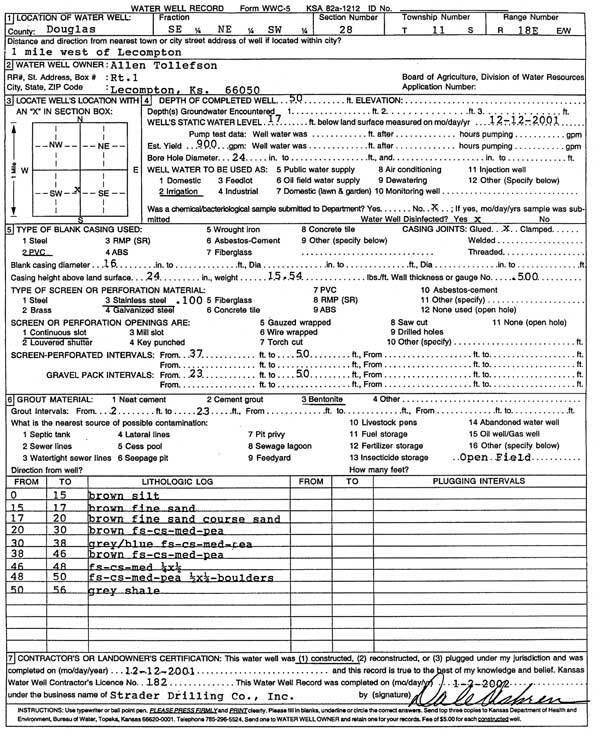 KGS Public Information Circular 20, The Public Land Survey System in Kansas, available on the KGS website or in paper form from the KGS, provides a brief explanation of how to determine section, township, and range for a specific locality. Some parts of the discussion on ground-water principles were adapted from the above publications plus Environment Canada's "Freshwater Website"